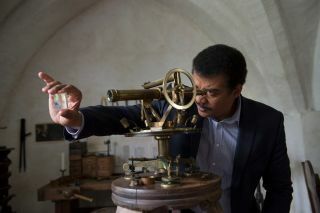 Host Neil deGrasse Tyson travels to Benediktbeuern Abbey in Bavaria to visit Joseph Fraunhofer's top-secret laboratory in the all-new "Hiding In The Light" episode of COSMOS: A SPACETIME ODYSSEY airing Sunday, April 6 (9:00-10:00 PM ET/PT) on FOX and Monday, April 7 (9:00-10:00 PM ET/PT) on Nat Geo. NEW YORK — Filming "Cosmos: A Spacetime Odyssey" was a brand-new experience for the TV show's host. Astrophysicist Neil deGrasse Tyson had made television appearances before filming "Cosmos," but co-creating and starring in a 13-episode TV show was an entirely different experience, Tyson said here at the American Museum of Natural History on April 9. Fox will air the sixth episode of "Cosmos" — called "Deeper, Deeper, Deeper Still" — on Sunday (April 13). The show is a reboot of the beloved Carl Sagan series, "Cosmos: A Personal Voyage." It was important to Tyson and others working on the show — including Steven Soter and Ann Druyan, two of the original "Cosmos" writers and the writers of the new series — to pay homage to the original series and Sagan's legacy throughout the show. The series began in the same spot that Sagan's started: on the California coast. "It's been a pleasure and a joy to follow Carl Sagan," Tyson said during another recent event. Occasionally, the production crew had to get creative with their shooting locations while filming "Cosmos." An area in New Mexico also doubled for Egypt during a recent episode featuring the science of Ibn al-Haytham, one of the first people to understand how the human eye works. Instead of traveling to the pyramids, visual-effects artists superimposed the ancient structures behind Tyson after he delivered his dialogue from the sands just outside the "Cosmos" set. The fake set morphed into what they needed for the show. Tyson also had a body double that would stand in for him before filming. The stand-in is similar in height, skin tone and weight to Tyson, allowing the "Cosmos" crew to use him when Tyson wasn't necessarily needed for filming at that moment. The attention on set was also a new experience for Tyson. "You get really spoiled, actually," Tyson said. "When I'm drinking something and I'm done with it, someone comes and takes it from my hand; otherwise, I have to walk it to a horizontal surface. But … everything here is [part of the] set, so you're not actually near anyplace to put down the drink." The episode "Deeper, Deeper, Deeper Still" premieres Sunday (April 13) on Fox. The new episode takes viewers on a tour of the universe on the smallest scales, exploring microscopic life that scientists use special tools to study. Tyson will also explain how memories are triggered through scents, and the Ship of the Imagination will fly under the surface of Earth to "discover the most mysterious particle we know," Fox representatives said. "Cosmos: A Spacetime Odyssey" airs Sundays at 9 p.m. ET/PT on Fox. It will be rebroadcast with extra material on the National Geographic Channel on Mondays at 10 p.m. ET/PT. Check local listings. To catch up on "Cosmos," you can watch the five previously aired episodes for free via Hulu.